The Penguins have resigned Deryk Engelland to a one year contract extension Wednesday afternoon. It is a two way contract, meaning he could move freely between NHL and AHL without clearing waivers, and would pay him 500k for one season at the NHL level. (would be less at AHL level) I think this is a good move for the Pens. Engelland has been a strong, consistent factor on the blue line in Wilkes-Barre Scranton and looked promising in his nine games in Pittsburgh last season. Though Engelland at 28 years old is one of the Pens older AHL prospects, there is still time for him to make his mark as an important fill-in or 7th defenseman at the NHL level. Also, his experience in Wilkes-Barre makes him a perfect defense partner for a younger prospect like Brian Strait or Robert Bortuzzo. 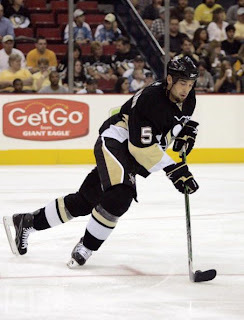 Though I am certainly not ruling Engelland out as a possible Pittsburgh starter next season because he has the ability, I think he will start the season in Wilkes-Barre/Scranton and see a few assorted callups throughout the season. Engelland's signing is also important on a broader scale because it shows that the Pens are already trying to get deals done with some of the players they intend to keep. Expect more to come soon.